To colour their cheeks the Egyptians used red ochre in a base of fat or Gum-resin. 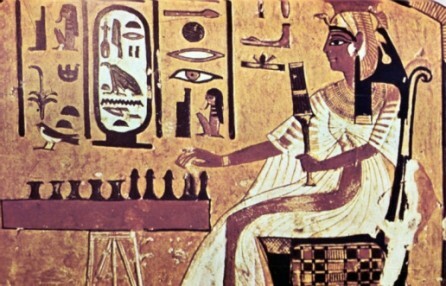 Ochre may have been used as lipstick, and a scene in a papyrus now in Turing shows a woman painting her lips with a brush whilst holding a container in her hand. Henna was used as a colorant, as it is today. 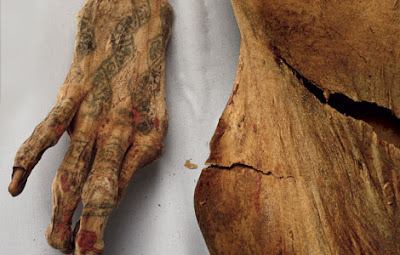 It was certainly used to color hair and perhaps also the palms of the hands , soles of the feet and nails, although it has been suggested that the henna-like stain i n these parts of mummies was caused by embalmers' materials. Tattooing was known and practiced by the ancient Egyptians , the earliest direct evident coming from the Middle Kingdom . Mummies of dancers and royal concubines have geometric designs tattooed on their chests, shoulders, armies, abdomens and thighs. In the new Kingdom, dancers, musicians and servants girls occasionally had a tiny representation of the god Bes tattooed on their thighs as a good-luck charm. The toilet object essential to all beatification is the mirror. In ancient Egypt mirrors took the form of highly polished metal discs,usual of bronze. Besides being functional, mirrors developed religious and funerary uses. Their circular shape, brightness and reflective quality suggested to the e Egyptians the face of the sun and its life-giving powers and thus the mirror became a symbol of regeneration and vitality . The religious aspect is highlighted in the motifs used to decorate the handles. The papyrus plant,m which figures frequently, is another symbol of vitality , as is the head of Hathor, a goddess of fertility and beauty . Metallic mirrors may have been restricted to the more well-to-do. For the poor a reflection in water had to suffice. The final element of dress was jewellery , a wide variety of which was worn by the ancient Egyptians. Although worn as personal adornment, much of the jewellery had an underlying amuletic purpose, to protect the wearer from harm-both tangible, in the form of dangerous creatures , and intangible evil forces which might invade the Vulnerable points of the body. Thus many items of jewellery take the form of amulets. Even certain of the materials used had amuletic properties, notably carnelian, turquoise and lapis lazuli. The most prominent types of costume jewellery were the collar and the pectoral worn at the neck. T Collars were usually board, covering much of the chest. They were made u of rows of beads , either plain, amuletic or floral, The strings of the various rows passed through large terminals which were themselves ornamental or amuletic , common forms being lotus flowers or falcon heads. The weight of these heavy collars was supported a the back by a counterpoise pedant called a mankhet. The pectoral developed from a single amuletic pendant hanging from a cord around the neck into a large plaque with ab amuletic motif, usually a deity r a large scarab. It was worn with bead necklaces or straps. A great variety of less broad and elaborate necklaces were also worn. Head ornament took the form of diadems or filets based on hands of live flowers, but the floral forms were also copied in metal and semi-precious stones . Earrings did not appear in Egypt until the beginning of the New Kingdom and they soon became quite elaborate. They were worn through wide holes punched in the ear lobes. Plain , mushroom-shaped ear plugs, usually made of stone, glass or glazed composition, were also popular. Limb ornaments consisted of armlets, bracelets and anklets, although a combination of all three was not worn until the New Kingdom and men did not wear anklets until the Ramesside age. Early types were made of shell ivory o beads, but they developed into opulent , inlaid metal jewels designed ti be worn in pairs. The Egyptians also wore finger rings. The most usual variety was a signet ring formed of a button sea pr scarab, but other amuletic types were also popular. Most of the rings which survive are made of glazed com position the design being cast in a mould. Nevertheless, heavy metal signet rings with figures of deities, royal names and protective hieroglyphs are also common.